New CREATe.org Whitepaper: "Cyber Risk: Navigating the Rising Tide of Cybersecurity Regulation" provides an overview of new requirements across the globe and also ways companies can prepare with best practices, voluntary guidelines, standards and the NIST Framework. 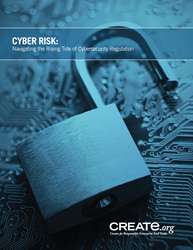 The whitepaper provides an overview of the ongoing wave of legislation, government regulation, procurement requirements, and court-imposed developments across the globe, following the pervasive increase in hacking and cybersecurity incidents. The whitepaper also explores new voluntary approaches and best practices collaboratively developed by governments and the private sector, designed to achieve stronger cybersecurity protections and to safeguard confidential information from loss and theft. Specifically reviewed is the development and utilization of the voluntary Framework for Improving Critical Infrastructure Cybersecurity (the “NIST Framework”), developed by the National Institute of Standards and Technology (“NIST”) unit of the U.S. Department of Commerce, as are other information-protection standards. For more information, please email info(at)CREATe(dot)org. Founded in October 2011, the Center for Responsible Enterprise And Trade (CREATe.org) is a non-governmental organization (NGO) helping companies prevent piracy, counterfeiting, trade secret theft, and corruption. Our mission is to make leading practices in IP and trade secret protection and anti-corruption achievable for all companies. To achieve this mission, we have developed CREATe Leading Practices for IP Protection, CREATe Leading Practices for Trade Secret Protection and CREATe Leading Practices for Anti-Corruption. These services are based on best practices drawn from multinational companies, academics, international and business organizations. CREATe services are available in a range of languages including English, Chinese, Japanese, Spanish and Portuguese. For information about CREATe.org, email: info@CREATe.org. Please follow us on Twitter @CREATe_org or connect with us on LinkedIn.